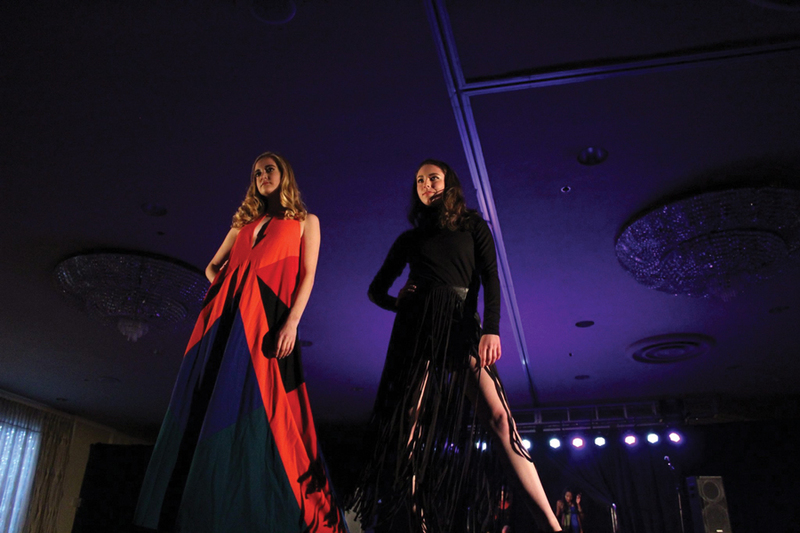 Student models Kelly O’Conor (left) and Gina Johnson pose on the runway at last year’s UNITY fashion show. The two will model at this year’s #SupportCPS show, which features the work of student designers. When Weinberg sophomore Lexi Schiff started brainstorming beneficiaries for this year’s UNITY Charity Fashion Show, she immediately thought of SocialWorks — a foundation created by one of her favorite artists, Chance the Rapper. Knowing the idea was ambitious, Schiff reached out anyway, determined to make her case. After a two-hour-long conference call, SocialWorks’ programming director recognized Schiff’s passion and told her she could stop pitching. She had landed the “perfect fit” for the show. Partnering with SocialWorks, UNITY Student Fashion Group will put on its #SupportCPS Fashion Show on Friday, featuring solely student designers for the first time in the group’s history. Students from Northwestern, Chicago Public Schools and Chicago City Colleges will see their work hit the runway in Chicago’s House of Vans. This downtown location, Schiff said, makes the event accessible to a wide range of audiences. The show will feature a variety of styles including streetwear, velvet and grunge looks, Schiff said. One of the designers, Devin James Gilmartin — who will attend New York University in the fall — will travel from New York to bring his eco-friendly brand “Querencia Studio” to the stage. Schiff said this year’s show is particularly special because all proceeds will go toward SocialWorks’ efforts to support CPS. SocialWorks has already raised more than $2 million, according to its website. Pointing to SocialWorks’ mission of “youth empowerment,” Schiff said UNITY’s fashion show provides a platform for designers to showcase their work and receive the recognition they deserve. In addition to having their designs showcased, the students also received mentorship from Chance the Rapper’s personal stylist, Whitney Middleton, Schiff said. Medill sophomore Lilli Boice, the show’s head of marketing, said the partnership with SocialWorks has opened doors for UNITY, allowing the group to expand its reach at Northwestern and beyond. While the show’s focus is on advocating for young designers, Boice said it also aims to celebrate diversity and break the stereotypical image of what a model should look like. “We really want to showcase that beauty comes in all shapes and colors,” she said. Growing up, Mbida said she rarely saw people who looked like her in magazines. Seeing herself in UNITY’s model campaign has been both “weird and encouraging,” she said. Mbida added that she hopes NU students feel more encouraged to express their own identities and appreciate artists on campus.